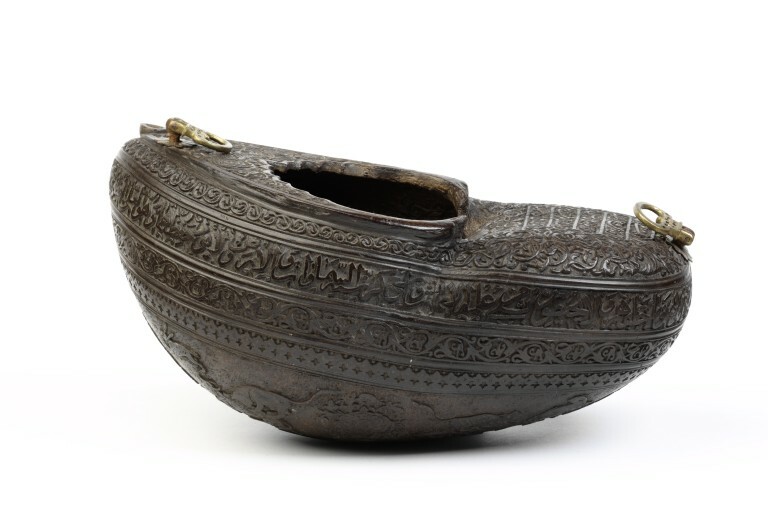 Kashkul carved from coco de mer. A mouthpiece has been added to make it a drinking vessel, and rings to allow it to be suspended. The surface is carved with Persian and Arabic inscriptions, as well as scenes including lions. It is of the light of the manifest Creator. Until the Resurrection this kashkul’s cry of “O ‘Ali”. 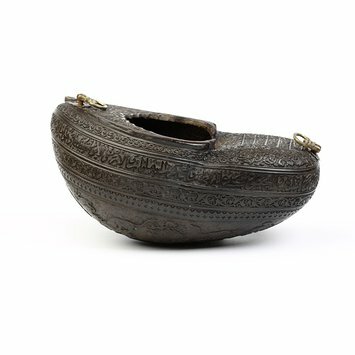 Kashkul carved from coco de mer, Iran, 1859-60. These bowls are made from a coco de mer (double coconut, Lodoicea maldivica), which probably came from the Seychelles. The surface of this one is carved in relief with animal combat scenes on the base - you can just see lions attacking bulls. function is reflected in the inscriptions used. enlightenment (7), and Shi’ite prayers (8).